http://ellokal.org/ In short, organized real estate violence, which is not new but has been getting much more serious for two years. We have seen investors buy whole buildings and send thugs with “offers” to tenants to leave, we have seen properties vacated in record time, we have seen the proliferation of ‘Desokupa style companies’ (companies which provide heavies to evict people) specialized in bullying and intimidation, and companies cashing in on alarms, armored doors, video surveillance, doing an kind of business with the expulsion of families. #RavalResistim Four evictions stopped in the barrio in one big day . 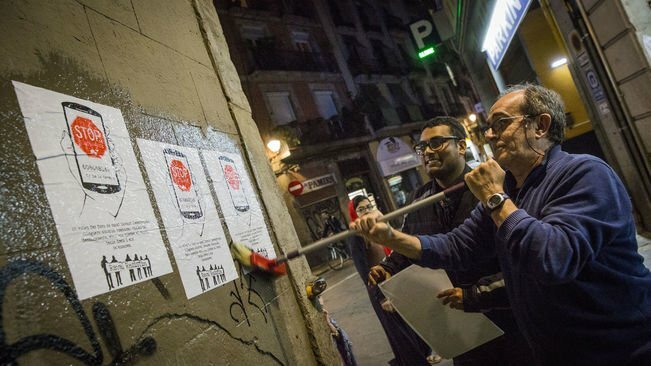 on the night of 9th March we started the public campaign with 2000 posters stuck up with the new phone number Stop evictions Raval, Raval resists… After the action we got word that today we had to stop 4 evictions and between 9 am until 12 we managed to do it. ,, At one of them the PAH (Campaign for Mortgage victims) joined us and more activists..by now we are the sum of many different groups, … squatters, non aligned, anarchist, etc..increasingly conjoined…. We had time and imagination to also remove an old fascist plaque… a great day. We have seen how demolition and harassment of the right to housing in the Raval has become a profitable business, while institutions simply cushion the problem with measures of last resort when people are already on the street. 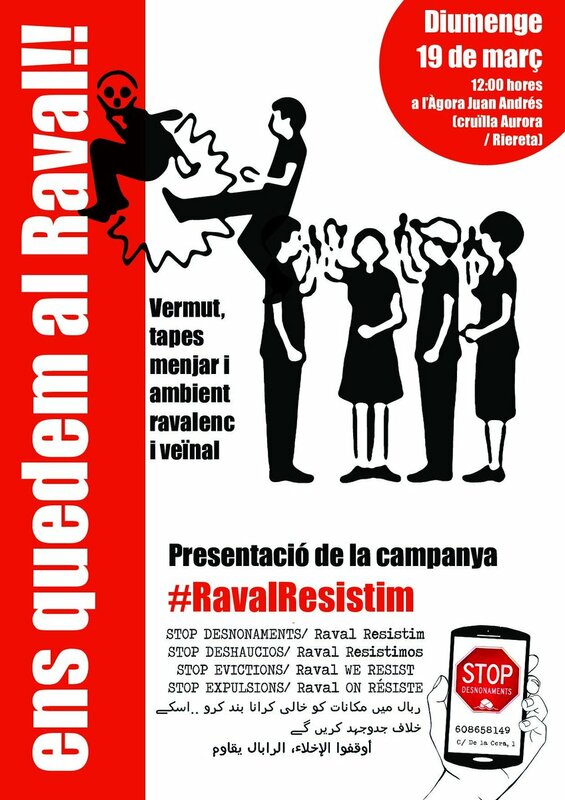 But in the Raval we do not settle for living between expulsions and nor do we want to naturalize a reality in which companies and individual investors play their predatory role with impunity and the administration arrives at the last moment to sew up wounds. We want to live in the place where we have decided to live, we want to defend not only our right to housing but also the right to take root in this neighborhood. That is why we have decided to start creating tools to defend ourselves against the permanent aggression that the neighborhood and its people are suffering. 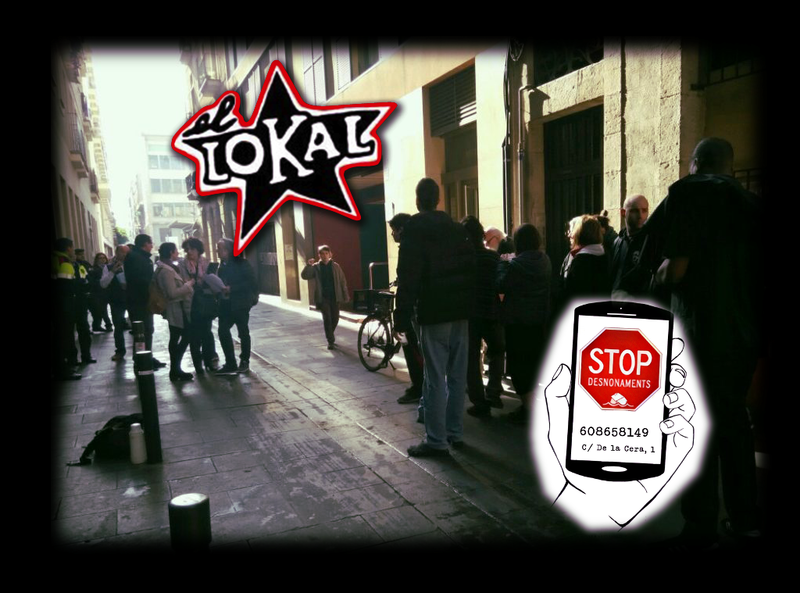 From tomorrow, the neighborhood of Raval will have a telephone that can be used in the face of emergency situations that are happening day by day in our streets. 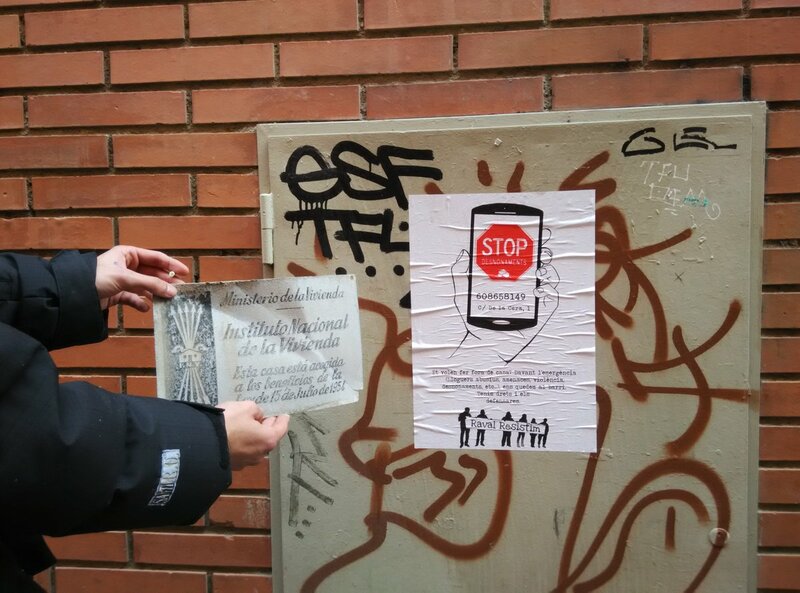 Tonight, dozens of neighbors took to the streets to make known through posters, leaflets and stickers on 608 658 149, the telephone , as a tool of mutual support to deal with real estate violence.We want this initiative to enhance the anti-hate work we have been doing for a long time in the neighborhood, thanks to which dozens of evictions Many have alreadybeen stopped, many of them from families with children, and which, without the neighborhood mobilization, would have been implemented without any social response. Onj this telephone will be given resources to know where to go to defend and enforce our rights, so that any affected person can count on the mobilization of the people of the neighborhood to protect themselves from the abuses, pressures and aggressions of real estate violence. March 2017. 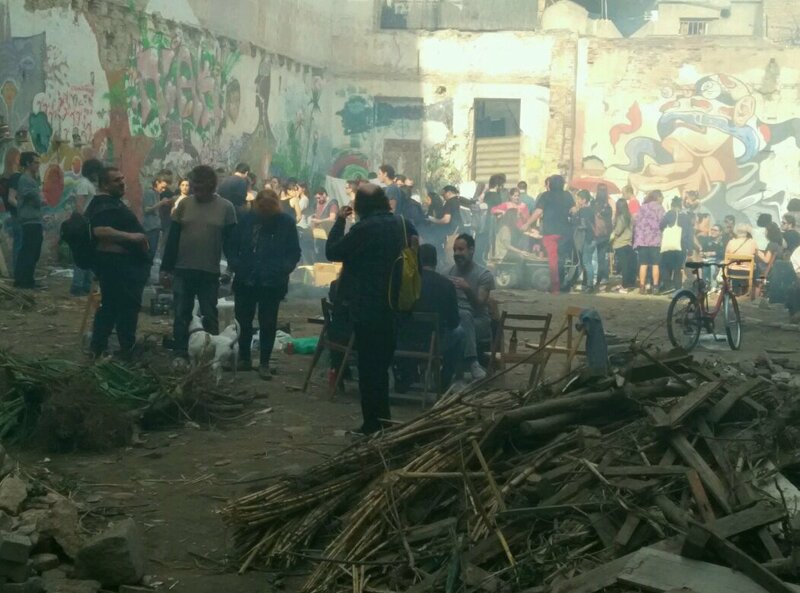 Sporing Onion Feast on site of a beautiful occupied Comminity garden..-Hort del Chino- in the Raval, which was recentlt trashed due to speculation.